The beautiful Giovanna can therefore represent all the young women who have paid the ultimate price for our dangerously large brain cases. 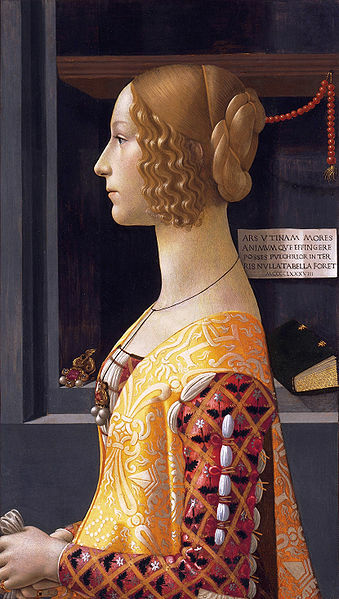 Giovanna was as high-status as you could get in the most advanced city in Europe in 1488, but that didn’t help her. Typical pre-industrial maternal mortality rates were from 1% (the rate in Chad and Somalia today) to 3%. They are two orders of magnitude lower today; rates are counted in deaths per 100,000 deliveries, and range from 2 to 50 in OECD countries. How are some countries of interest to us doing on this metric? Here’s a table for the OECD drawn from the CIA World Factbook. I’ve added the much higher and less noisy rate for infant mortality. The rankings correlate roughly, but not in detail; they capture different aspects of health care, since infant mortality is more a matter of antenatal care, maternal death of emergency obstetrics. No surprises really. Health care in the USA maintains its resolute mediocrity on maternal mortality as on other metrics. Maternal mortality is two to three times that achieved by a substantial group of high-performing countries, infant mortality 1.5 to twice. Some of the high-performing countries on both, like Spain and the Czech Republic, are quite a lot poorer than the USA. Could there be a genetic component to maternal mortality? A study in New York found rates much higher among African-American women, controlling for poverty and lifestyle. 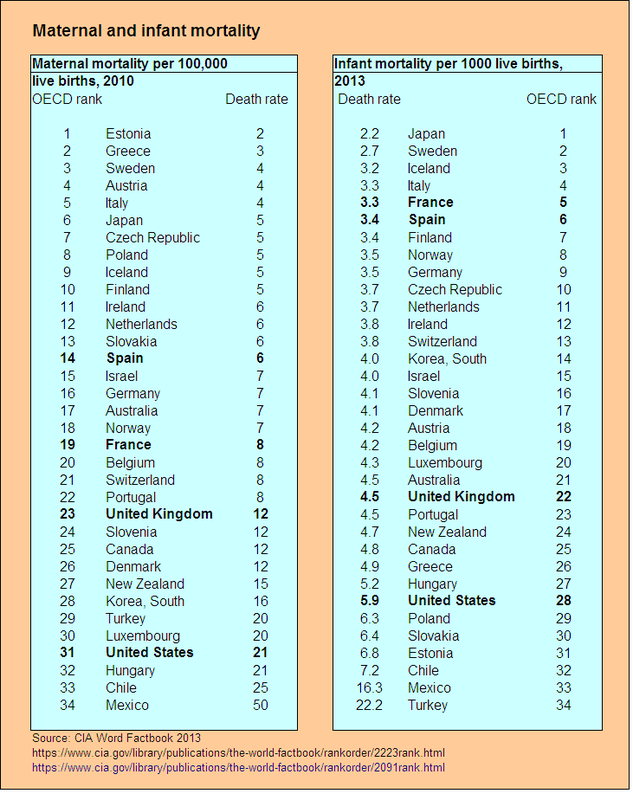 Cuba does better than the USA on infant mortality, but much worse on maternal. Genes or hospitals? If it were genes, you’d expect to see higher rates in West than in East Africa, which doesn’t seem to be the case. We should keep an open mind on this one. How terribly sad. Did the baby die too? I fear not, judging from Giovanni’s letter to Lorenzo de Medici after the tragedy, quoted here: “e la creatura sperata da lei, gli cavammo di corpo morta, che m’Ã¨ stato ancora doppio dolore.” My Italian is not good though, and Google Translate won’t deal with cavammo. It sounds like you guess rightly. It’s very sad. It still amazes me that every single person walking around the planet came out of somebody else (one way or another). Totally cosmic. Add bipedalism to the brain case. Bipedalism constricts the birth canal; the brain case expands the fetal circumference. Collectively, a good example of unintelligent design. Mother Nature is a kludge. And James, why would you expect genes to show higher rates in West than in East Africa? I’m not disputing this assertion, just wanting to know what it is based on. If it’s an African-American gene, then you’d expect to find it differentially in West Africa, and among the descendants of West Africans through the slave trade in Brazil, Cuba, Jamaica, and the USA. East Africa is the origin of humanity, so everybody radiates out from there genetically. An East African mutation for risk of maternal death would either be ancient and universal, or recent and local to the region and so irrelevant to the USA. On a similar basis, I proposed here that Barack Obama (half-white, half-Luo) was closer genetically to Hillary Clinton than to his wife Michelle. It’s a perfect storm that rages against pregnant women in the U.S., and poor women and women of color in particular: The lazy rationalizing of physicians of suboptimal practices for their own convenience, cuts to maternal health programs, loss of income and health insurance, and chronic stress among African-American women. Tell me about it. During the birth of our eldest daughter, after 12 hours of labour, and my wife passed out from exhaustion, I was thrown out the theatre, and the gynaecologist set to work with a forceps. Born with a black eye, the now-grown woman still carries a tiny scar on her eyelid (it was supposed to be “gone in a few days”, but in a way I am glad it wasn’t). “Big baby, small mother” was his comment afterwards “You can send her to shcool tomorrow.” – she weighed just short of 10lbs. Actually, he alluded to genes as well – my wife is South Asian, I am Irish. His opinion was the baby was bigger than a South Asian woman would usually carry. Our second child weighed almost the same, but was a problem-free delivery. Who pioneered the forceps birth? A benefactor of humanity. Would it have saved this young lady? Do you have diabetes in the family? It’s correlated with high birth weight. I weighed 11 pounds. Diabetes is not so much correlated with high birthweight, as diabetes pretty much directly causes high birthweight. (Sugar, y’know.) Maternal diabetes is fairly common and resembles a temporary Type II diabetes. On the other hand, the causation does not mean perfect correlation–my li’l monster was a bit on the light side, even though my wife had mild maternal diabetes. Hah! The doc started the strong pull with the forceps with just me and a nurse (y la madre, claro) in the room, and when the bed came rolling he not gently directed me, “LOCK DOWN THOSE LEGS”. Which I was happy to do. I am not easily perturbed by uncertain situations but I admit for a minute or two I was beginning to wonder. About a lot of things, that we take for granted. There were several very distinct impressions from the forceps on her skull, which I found quite disturbing. They did indeed go away soon after, thankfully. James, I wish I had time traveled to read this post back a year ago when I strolled through that museum, after several glorious hours in The Prado. I could have focused! But I also didn’t discover Hughes’ Barcelona until afterward as well. Sigh. Fascinating history of the use of the forceps in Wikipedia – it was pioneered in 17th century England (so too late for Giovanni Tornabuoni, if it could have saved her), but was kept as a family secret for 150 years. It came into general use in the 19th century, but is now largely replaced by vacuum suction or sectioning. Whoops, didn’t read your comment before posting, sorry! That really is some interesting stuff, including the bit about keeping forceps secret. Too bad Intelligent Design couldn’t have intelligently designed an exit for the baby through the mother’s big, open, bone-free area just between the top of the pelvis and the bottom of the ribcage — otherwise known as the belly. God is a civil engineer. No. A competent civil engineer wouldn’t put a recreation area right next to the waste dump. Who said anything about competence? I’m somewhat surprised that the UK is doing comparatively poorly; no matter what else one says about the NHS, prenatal care and maternal care is supposed to be pretty good, and my personal experience has been very, very good. I can to some extent understand a slightly higher maternal mortality; maternal care is very midwife-centric in the UK (and a comparatively high number of women give birth at home in the UK, though still less than 3%, as I recall), so it may be more likely that there isn’t a doctor on hand if something goes wrong during delivery, but I honestly wouldn’t know how one could improve much on the prenatal care I’ve received for either of my daughters. A speculation. The NHS is closing small maternity units (against local opposition) and concentrating services in larger specialist units. The policy is probably driven by perinatal mortality and morbidity. Problems for the mothers are much rarer. But maybe what’s good for babies here is not so good for mothers. Is it immigration? Spain and France also have lots of immigrants with traditionalist ideas on the status of women, and nuch better numbers. The big struggle around this issue in the UK is that the NHS does not want to pay for caesarean sections, but increasingly mothers want to have them — an interesting reversal of what the debate was in the US. Estonia (pop. 1.3m) has only 15,000 births a year so the maternal mortality rate of 2 per 100,000 must mean roughly “we had a death four years ago”. A very noisy number. Latvia and Lithuania have the higher rates you’d expect, so it’s unlikely to be economic, genetic or cultural factors. (When I worked in the Baltics a little in the 1990s, I noticed how little they smoked; something Russians did.) Estonia’s infant mortality is also ordinary. Maybe they just have one very good obstetric unit in Tallinn. Too bad about the forceps; Anonymous’ daughter can never grow up to be President of the United States. The Constitution says that no one except a natural born citizen can hold that office. Time for the next generation of birthers to start looking into the birth records of future candidates. We cannot have anyone who was delivered by forceps or c-section holding the highest office in the land. Some apologists have claimed that the US’s poor ranking in infant mortality is due to some special way we count births– somehow, they say, we count very early premature births as births rather than as stillbirths, or something. But that claim looks less persuasive now that we see the US’s maternal mortality is also poor. And we spend half again as much on health care per capita as any other country. More than 40% of American births are paid for by Medicaid. Anyone else surprised by that high number? Not at all; no one under 40 has any money or health insurance benefited jobs in this country. I’m not all that surprised; it’s high, but not unbelievably high. Medicaid is far more accessible (due to greatly relaxed eligibility criteria) for pregnant women than for other people, but does not cover abortion in most states, and the lower your income, the more likely it is that you don’t have access to reliable birth control . The problems of American healthcare are not universal, either. If, like me or my parents, you are affluent (and don’t suffer an income-destroying personal catastrophe), then you do get to enjoy very good healthcare as an American, where the biggest risk you are likely to be exposed to is overtreatment (due to the practice of defensive medicine or for other reasons). If you’re poor, you can expect that your life expectancy is reduced by a decade or more. Poor or limited access to healthcare for low-income families is probably one of the primary causes for the comparatively poor average performance of our healthcare system. With respect to maternal and infant mortality, I suspect (at least according to the studies that I know of) that it’s not directly inaccessible quality healthcare that is responsible — because Medicaid is fairly accessible to poor pregnant women  –, but other risk factors associated with poverty: unplanned pregnancies at too old or young an age, existing chronic medical conditions, the cumulative effect of multiple pregnancies (with or without C-sections), obesity, domestic violence, substance abuse, etc. Note that maternal mortality is massively higher for low SES women even in the UK, where they have access to the exact same care as high SES women at zero cost (even prescription charges in England are waived for pregnant women). As my first OB/GYN explained to me: Using condoms as your primary method of birth control means that you’re fine with having 3+ unplanned pregnancies over the course of your adult life and having a good chance of getting pregnant, want it or not, while still in college. Even oral contraceptives require fairly rigorous use to be much more reliable, and ideally you want an IUD  or an implant (which is also cheaper in the long term); but low-income women generally don’t have the cash flow for the latter methods. Of course, back then it was also held that IUDs were a bad idea for young women because it was believed that there was a risk that they could cause infertility. That said, if you’re just above the Medicaid eligibility threshold, you may find yourself skimping on prenatal, perinatal, or postpartum care, too, depending on what your insurance covers and what level of co-insurance you have to deal with. That’s a lot of poor kids being born. Medicaid eligibility varies by state, and is generally much higher for pregnant women. For example, in Louisiana it’s 200% FPL for pregnant women. In Michigan, if you’re pregnant and have a family of four, then you are eligible up to about $42k income. But yes, fertility and household income have a strong negative correlation. I thought that was well-known? I agree with you, Katja: 40% of births paid for by Medicaid is high, but not astonishingly high. 133% might be the mandatory minimum but in most states it’s quite a bit higher. I can’t look at this right now, but if you go to KFF.org you can find a lot of statistics on Medicaid coverage. One more comment: The U.S. lags even among affluent women, and this is mostly the result (as I said above) of lazy obstetric practices, and in particular, early induced labor or (especially) early c-section. Outcomes in minority groups are associated with poor access (espcially true for Native Americans) and stress (especially true for African American women). So any combination of these factors makes the likelihood of an adverse maternal outcome much higher, while the first (early delivery by c-section) is a big fat black mark for outcomes for both mother and baby. There are other factors at work, though: Increased maternal age is a risk factor for Caucasian women, whereas, preterm delivery is a risk factor for African-American babies. I mean, we have risk factors coming and going in the U.S. and it’s no surprise that it shows up in statistics like this one. But you can tease out the individual factors and try to intervene where you can. Hi, regarding Medicaid, one reason why Medicaid accounts for the coverage of so many births is that the mandatory coverage level for pregnant women is around 200% of the federal poverty level. That is, there has been a commitment to covering pregnant women that is lacking for universal coverage generally. It ranges state by state from a high of around 65% (Louisiana) to a low of around 25% in states like North Dakota. Virginia is probably the most populous state with a below average Medicaid coverage rate (like around 30%). California, for instance, is right around 50%.